An evocative and entertaining study of the history of the money markets, from the perspective of an insider and eye-witness. The convergence of high-speed global networks and the rapid growth of financial trading markets helped to reshape the way we live. financial information to banks and investment firms. Spreading rapidly to virtually every other part of society, a colourful and amusing financial markets history is described in Tales from the South Pier, written by John Jessop, an influential industry pioneer. History shows that in less than a generation, the technology designed for financial trading markets had formed the basis of the media of communication and entertainment for a broad, global audience – to the point where each citizen of the planet could, literally at the touch of a button – contact any other citizen of the planet. The same technology offered uninterrupted access to the knowledge that can affect our opinions and determine our responses. Traders, just a few decades ago, could only engage in transactions by sending telegrams or by operating slow, expensive telegraphic machines called telexes. The revolution meant they could now trade in real-time via desk-top computers, the same devices that also connected them to the prices, news, commentary, analysis and other intelligence they need in order to function in a competitive marketplace. The history of the financial markets serves as the roadmap for the digital world we now inhabit. proportions by the constant shrinkage in the size of computer chips. Desk-top computers shrank to lap-tops and lap-tops led to hand-held, multi-purpose, mobile telephones. 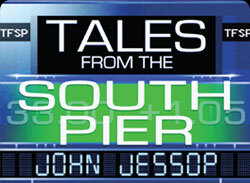 In Tales from the South Pier, author John Jessop, who spent a working lifetime in the financial information industry, recalls the early days of the business and its explosive growth with the perspective of an eye-witness and the perception of an insider. Tales from the South Pier is not a textbook work, but is a story of the financial markets history, told through the personal experiences of the author, and others, employed by industry leaders in financial information such as Reuters, Telerate and Bloomberg. Replete with scandals and amusing anecdotes. Tales is a colourful history of a multi-billion dollar money markets industry that helped to change our behaviour and forever altered the way we interact with the world. Read reviews of Tales from the South Pier.